Market sentiment has shifted from 2017’s surprise growth and low volatility to 2018’s rise in macro uncertainty and tightening financial conditions as U.S. rates rise. Yet major stock indexes are near record highs, despite a somewhat turbulent first half of the year. Private equity firms continue to raise mega-billion dollar funds and merger activity continues to consolidate in all industry. According to a report, the number of publicly listed companies in the U.S. has fallen by a fifth over the last decade, and by half over the last 20 years. Where are we in this point of the cycle? Is the balance of power is shifting from public markets available to all investors into private markets? With near record levels of dry powder, how could global markets absorb all of that cash? Which industries have pockets of opportunity for investors – and do those industries differ across the U.S., Asia and Europe? So you know I think the short answer is yes of course we had Vista certainly think so. The great opportunity for us as an enterprise software. Last week there was a study cited by CNBC that 60 percent of CFOs identified access to talent as their number one concern greater than access to capital markets. So the headline was Sopha is more important than money. Which is hilarious because nothing is more important than money as we all know. But the important thing to realize now is that non tech people within organizations recognize how important and how dangerous technological obsolescence is. And as my partner Robert likes to say if you don't think your industry is getting transformed by technology then it's probably already happened. We are in the middle of what we like to call the fourth industrial revolution and it involves the digitization of everything that we do and the great investment opportunity and I think all of us are are involved in it is identifying the winners in technology that are going to help us as we navigate this transition from what we like to call an analog economy into a digital one. And just like 100 years ago it was you were transitioning to an electrified economy. You didn't ask people whether or not they were in electrified company or not. I think in the same way very shortly we're not going to ask people if they're digital or software business they're just going to be business. And I think part of the reason why these CFOs identified access to talent is such an important part is many of them don't come from a technology background. And I think it's going to be harder and harder for sea level executives across the world who manages who manage businesses regardless of industry to not have a technical background because it's just the the it's the lexicon of the future and it's the way that their businesses are being transformed today. So in software a part of what makes it so exciting for those of us who invest in software is it's one of the largest part of the technology industry which has changed a lot. When we started Vista 18 years ago it was 10 percent of total technology spend now it's over 50 percent and it's growing faster than the overall I.T. budget. It's a trillion dollar industry but unlike a lot of big industries it's not dominated by big companies. And even though we are the fourth largest software company in the world collectively that's 16 billion of revenue is a drop in the bucket compared to the global technology industry. Just as Microsoft the 100 billion dollars is a drop in the bucket. And so the reason why that is is companies and customers recognize that the productivity of software is fundamentally different than any tool to have. You mentioned this earlier the return on investment for software is roughly 700 percent. And it eclipses that things like management consulting contracts Six Sigma. For those of you remember with that as investments and investments in things like clean energy and revamped infrastructure and so because it is so productive companies put up with the fact that there are so many software vendors. So the reason why we think it's perfect for private equity is we've identified over 40000 companies around the globe with more than ten million dollars in revenue. That provide software 90 services. The average enterprise customer of ours has over 1500 software vendors. Now they might have two or three for furniture and one or two for other aspects of their purchasing but on average they have 1700 software vendors and so that opportunity to buy leaders and niche products is a great one. 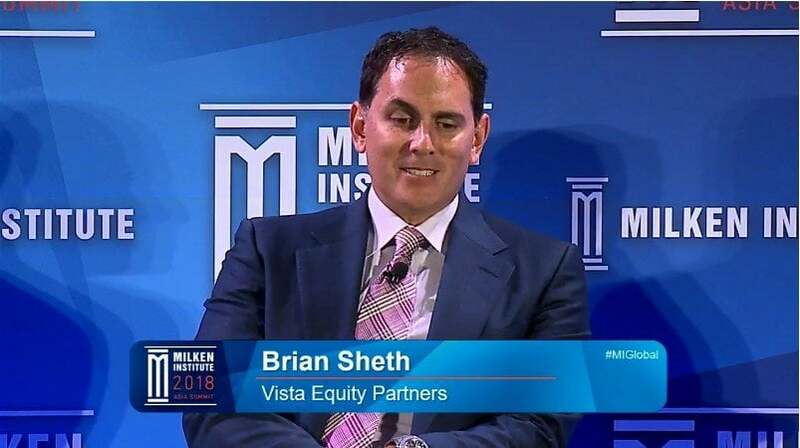 And then what Vista does is really transform many of these companies that are built on products and help them become great businesses because so many of these companies are run by founders. I'm not sure if I answered any of your questions but thanks for letting me talk. Well I think. I think you did I guess at the end of the day none of us really can quantify the geopolitical risk but there and some of the other risk but there is no question that the opportunity around technology and to your point it touches every industry. I didn't hear you pick any one particular but well you know part of what's going on in the United States for example where I live is that you know there's tremendous concern around what the impacts of technology and its dissemination and kind of the broader economy. But one of the things that Mike told me last night in the last three years Amazon is investing an additional 75000 robots in their warehouses and over the same time period they've increased their employee count by 60 percent. So technology really enables us to do more and be more productive and that allows us to create new opportunities in the 90s everyone was worried about the first wave of software it was going to outmoded everyone who was in kind of the manual workflow positions people in accounting people in accounts payable and many of those jobs didn't go away. When employment expanded right.